Booking/damage deposit is $500 for all events and is due at time of booking. Use of great hall, 2 ready rooms, 3 bathrooms, and kitchen facilities, 80 chairs, 2 tables, CD with 100 plus pictures of your event and initial set up prior to arrival of your guests for 5 hours. (Guest responsible for own cleanup & trash removal). Use of great hall, 2 ready rooms, 3 bathrooms, kitchen facilities, 17 tables, 100 chairs, linen table cloths, CD with 200 plus pictures of your event, and initial set up prior to the arrival of your guests for 6 hours. (Guest responsible for leaving kitchen as found). Great hall, 3 ready rooms, 4 bathrooms, kitchen facilities, 25 tables, 120 chairs, linen table cloths, 5’ cake table, initial setup prior to arrival of guests, Cinderella carriage for wedding party photo shoot, CD with 300 plus pictures of your event, trash disposal, clean up after your event for a period of 10 hours. (Reflecting pool may be added for an additional $500). Great room is suitable for events of up to 100 attendees. Outdoor functions up to 200+. Special Features: large dance floor over indoor heated pool, granite kitchen facilities with pyramid ceiling. Interior facilities for 120 guests. Outside facilities for 250 guests. When you rent the castle you have full use of both the outdoor an indoor facilities. My Organization Held a Semi formal at this great venue! Owner is really relaxed and will work with you 24/7. The Castle Event Center Is an amazing and beautiful venue that can truly only be admired during the night with all the Christmas lights on. Contains a very romantic setting with a theme surrounding the medieval era. A lot of great opportunities for pictures!! Great place to have your special event, would definitely recommend the castle event center for any of your party needs,worked with our time and day, and I got the biggest package which made clean up so much easier, they made my day even that more special for me and my husband! This place was amazing! Not only was the owner extremely helpful in setup and cleanup, but he also took amazing pictures for us! This place is so beautiful and fun everyone had fun and loved how beautiful the place was! I would definitely reserve this place for future events. i celebrate my wedding in here and it’s awesome. nice place and not expensive at all for all things of that. it was fun, i love it. i will definitely introduce my friend here and i will come back soon. Was such an amazing place to have a party!!!! Will always recommend this to anyone and everyone!!!! My new sister-in-law and best friend and her husband got married here on July 30, 2016. All I can say is wow. As her MOH and wedding planner, I was blown away by how amazing our experience was. The owner has got to be one of the most laid-back, nicest, and most flexible guys around, which is saying something for West Texas. Not only was her wedding a fairytale with the whole Cinderella theme, but he got the deposit back to us before I left the building and the pictures, which he does himself, we're ready by Tuesday. He helped me set up, took any specific picture we requested, and literally shooed me out the door afterwards to stop me from cleaning up. Such a beautiful place and wonderful experience! Absolutely recommend for anyone who wants to get married in Lubbock! Beautiful day, beautiful venue. Parker, the Castle owner, let us bring our own fireworks to shoot off after the outside ceremony and indoor reception. A truly Perfect day! He was easy to work with and he even set up an extra table when we noticed more guests had arrived. 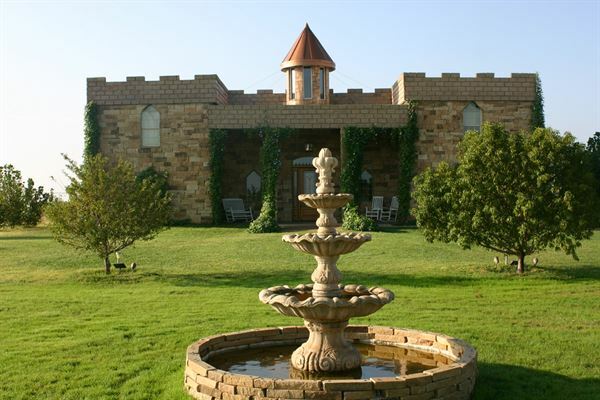 I would highly recommend The Castle Event Center in Lubbock Texas for your next event! We were on a tight budget, and somehow found this amazing place. It was everything and more!!! They provided and did everything but cook! You can't beat it! Parker and Derek were an absolute joy! Made our day magical and stayed under our budget. Would highly recommend for any event !! We had our ceremony and reception at the Castle Event Center, and I could not image having it anywhere else! Parker was great, every time I called to ask a question he had an answer or found it out for me. The location is amazing, and perfect for pictures! All of our guests complimented on how beautiful the venue was. The package we got made everything so easy for us. I would certainly recommend this location for any event to every one! You won't be disappointed! The Castle Event really impressed me on my daughter's wedding. They were very attentive and made us feel like royalty. They immediately gave us a refund on a unused hour. Strong ethics! we had a very good time! very profesional! we had a great time! The man that owns this venue was very nice and was great to work with. Very clean place and just perfect for 150 people that we had! This was the most amazing experience!! We absolutely loved the space and the owner is amazing and extremely accommodating to any thing that we needed. The package that we picked was the biggest one that they offer and it is so worth every penny!! Our wedding was so beautiful and how cool is it that we got married in a castle. We couldn't have asked for any better. Simply the best. The Castle Event Center was a magical experience. The decor was amazing and made our night memorable. With a remote location only minutes from the city; make this place a whole new world!! I definitely recommend this location to everyone!! :) 5 Stars all the way!! My daughters wedding and reception were held at the Castle Event Center. The grounds were beautiful and perfect for the out door ceremony. Everyone commented on how wonderful and unique the venue was. There is a wide variety of packages so we were able to get exactly what we needed. I highly recommend having your event at the Castle. The castle event center was a beautiful and accommodating place to hold our wedding! It was really easy, fun, and stress free! I highly recommend it to any bride! The prices of the packages are terrific. We did very little decorating because the venue is so beautiful just like it is. The inside as well outside lighting was incredible. Mr Hinesly supplied our every need. He also supplied the extra tables and chairs we ending up needing at the last minute. The ready rooms were great and more than big enough for everyone. We were a little concerned that the great hall might not be big enough, but it turned out to be just the right size. We really like that all the tables and chairs were setup before we arrived, so it saved us a lot of prep time. The pictures taken during the event and put on a cd were really over the top. Thank you so much for making our wedding perfect. The prices of the packages are terrific. We did very little decorating because the venue is so beautiful just like it is. The inside as well outside lighting was incredible. Mr Hinesly was able to take care of our every need. He was even able to supplied the extra tables and chairs we ending up needing at the last minute. The ready rooms were great and more than big enough for everyone. We were a little concerned that the great hall might not be big enough, but it turned out to be just the right size. We really like that all the tables and chairs were setup before we arrived, so it saved us a lot of prep time. The pictures taken during the event and put on a cd were really over the top. Thank you so much for making our wedding perfect. We used the Castle Event Center to host my Dad's surprise party. It was a great all around experience. The owner was very helpful and really took care of us. The environment was perfect and the food was easy to serve out of the kitchen. It's worth the little drive outside of town. If we have another occasion, we'll go with Parker again!!! We had an outdoor wedding and an indoor reception at the Castle Event Center. My husband and I wanted a venue that was unique and beautiful for our wedding, but we also didn't want to pay a fortune. The owner was very friendly and easy going and his prices were very reasonable. We had the ability to decorate however we wanted as long as we were able to undo it. This was a huge selling point to us, since previous venues we had attended had many restrictions. We got so many compliments from friends and family about the venue! Our wedding turned out gorgeous and we couldn't be happier!!! We just had a family reunion swimming party at the castle and it was fantastic! Such a unique setting too.. a castle in Lubbock! The kids wore themselves out in the swimming pool and playing games on the front lawn. I especially enjoyed sitting on the porch at sunset... such a great place to view the beautiful Lubbock sky! We will definitely have another event out here, it was a hit! The atmosphere of the Castle is phenomenal. The indoor pool makes for great gatherings along with the wood floor dance floor. My aunt had her wedding there and it was absolutely fabulous. The environment is very friendly and unique. It is very spacious as well. I also went to a family gathering/swimming party and it was wonderful. The pool is the perfect depth and tempature. It is extremely well kept an very clean. It's a great place to have family gatherings, birthday parties, graduation parties, and especially weddings. The owner of the Castle Even Center is also very understanding and nice. I'm from Lubbock so all my friends and family wanted the wedding in Lubbock so my family found the castle event center for me. I was thrilled that the wedding I had dreamed of all my life came true. The grounds are so lovely at sunset and the carriage was perfect for the wedding pictures. This venue has everything you need to have a perfect wedding and reception. I truly felt like a princess marrying my prince charming. I would encourage anyone looking for the place of your dreams to check out this event center. And the best thing was we had our rehearsal dinner there and had a great time after dinner swimming and just having a good time. We were privileged to find the Event Center on Craig's list. From the first contact with Mr. Hinsley my Wife and I knew this was the place we wanted to have our wedding. Mr. Hinsley was extremely helpful in giving ideas with the setup and did not question any ideas we had. He allowed us to pretty much take over the property. The Castle made for the perfect back drop to an already amazing day. We could not have asked for anything more and recommend the Castle Event Center to anyone for pretty much any type of event. I know that we will be going back. Special Features: Lush lawns, fountains, bronze statuary, 18' high ceilings, 3 ready rooms fenced in yards for younger kids, nursery and kitchen facilites.